The night Luke Voit was traded to the Yankees, we all sort of empathized with Chasen Shreve crying after he heard the news. Sure, he had his struggles but here was a guy who spent a chunk of his baseball career with this group and, in an instant, he was out the door for an unknown minor leaguer and international pool money. Of course, like everything else in baseball, time passes and all it took was a few good games to flip the script. All of a sudden, the Voit trade seemed like another genius Cashman move. A few days after being called up to the main roster, Voit went off on Sunday Night Baseball. That night he jacked two dingers. The first was off Alex Cobb in the 3rd inning and the second was off Cody Carrol in the 10th. With a lineup that was seeing too much of Shane Robinson and the Red Sox continuing to win, finally there was some hope. In the coming games, Voit kept on delivering — and in big spots too. You could make the argument that, with Judge out, he just picked up the captain’s production. 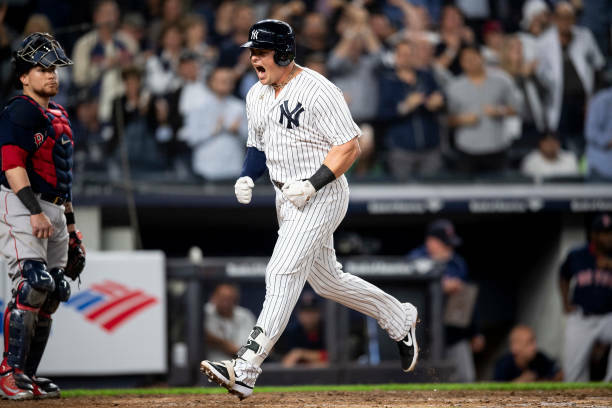 In the end, as we all saw, Voit put on a remarkable show in 2018. Here was a guy who relegated to the scrap heap in St. Louis and he became an integral part of the New York Yankees in a very short amount of time. Not only was he mashing David Price but, against a fearsome reliever in Blake Treinen in the Wild Card game, Voit was able to stick a knife into the heart of Oakland’s season. For 2019, Voit might not have the numbers he had in 2018. Still, whatever happens next, after a long winter of everyone online kicking around whether Voit is for real and whether a Bird will rise from the ashes, it was probably an emotional moment for the Voit family to see 46,000 people say LUUUUUUUUUUUUUUUUUUUUUUUUUUUUUUKE in unison on Opening Day. For a guy who had thousands of minor league plate appearances, it had to have been something he thought may never be in the realm of possibilities for him. It probably felt better to see him deposit a dinger of a gift in gratitude to the ghosts resting in Monument Park in that first at-bat, too. That was Opening Day, though. That first party in the Bronx feels so far away after the injury bug hit the Yankees hard. Sevy and Betances have been out. Hicks has been hurt since spring training and he hasn’t even looked at baseball activities yet. Then, in one day, the Yankees lost both Giancarlo Stanton and Miguel Andujar — with Miggy possibly being out for the year. If there was ever a time for Voit to come through, now would be that time. 0 HR, 1 RBI, .133 AVG, .278 OBP, .133 SLG, .411 OPS. Maybe 2018 was fun while it lasted for Voit. Maybe what we saw of him was the best he had and now the league caught up. With the way our pitching seems to be able to shut down an offense, if Voit or anybody steps up the way Didi did last April that would make all the difference. Voit did it once and it would be great if he could do it again. Whatever he had cooking last year, maybe go back to that. Or, if they figured you out, tinker with the recipe a bit. The Yankees could certainly use a bridge to Stanton and Hicks. And look, if it is a fleeting moment and Bird does indeed end up being the word once again, at least it was a good show for a 2018 season that had more downs than the stats let on.